So I guess I should start off this post with a little apology. Sometimes I think its easy to take for granted the time and effort it takes to run a blog. Blogging isn't my full time job and believe it or not I actually have a life outside of nails. Lately my personal life has been rather busy and my nails have taken a back seat. I've either struggled to find time to paint my nails, or if I have managed to paint my nails I've then struggled to find the time to go through and edit my photos and blog. If you follow me on Instagram you'll have seen that I have recently been offered my first job since finishing my degree. I'm really excited for this new venture but also quite nervous. I'm not sure exactly when I will be starting and I think initially I will find blogging alongside a full time job quite challenging so please bare with me! I will be working in a hospital where I wont be able to have my nails painted; limiting the time I have to do my nails. I'm sure I will work out a balance over time so please be patient with me! So onto the real purpose of this post. 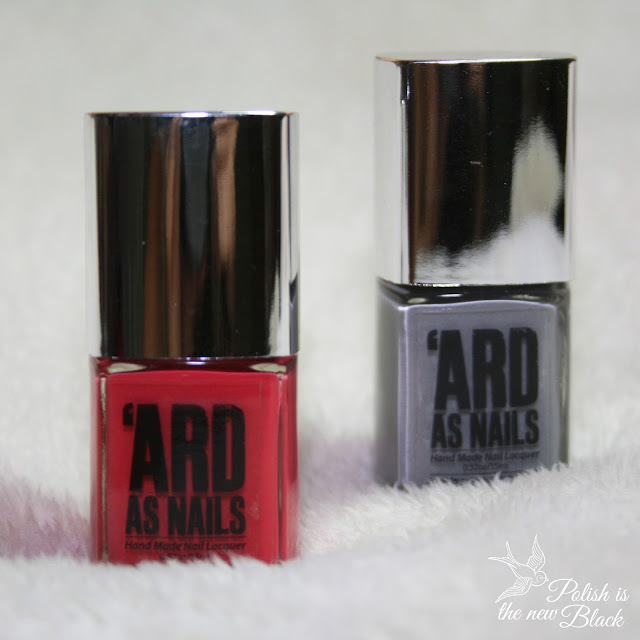 Today I have for you some swatches and a review of a UK indie polish 'ARD AS NAILS created by Soap Dodger (a company that creates a range of bath, beauty and home fragrance products). You will find their website HERE where you can browse through their products. All of their polishes are 5-free, cruelty free and EU approved. Their polishes start at £5.50 for a 15ml bottle, but they are running an introductory offer of 2 for £10 or 4 for £18 on their creme polishes. First up we have Dolly's Day a gorgeous raspberry creme polish. Shown here is two coats topped with top coat. The formula of the polish was great; application was very smooth and I absolutely adore this shade! I think its so pretty! This polish is £5.50 alone or can be bought as part of the 2 for £10 of 4 for £18 bundles. Next up we have Slated; a light grey creme polish. I love this shade of grey! Shown here is two coats topped with top coat. Again the formula was great and application was very smooth. Again this polish is £5.50 alone or can be bought as part of the bundles mentioned above. I think both of these polishes are truly gorgeous! They are great staple shades to have among your nail polish collection and the formulas of both were great. An added bonus that they are 5 free and cruelty free! I also think the prices are very reasonable for the amount of product and postage is free! I would definitely recommend these polishes and I would love to try out more of their shades since I have been so impressed with these. What do you guys think of these polishes?